Are you keen to learn everything about Short term Debt Funds? If yes, this post discusses What are Short Term Debt Funds, meaning, performance, returns and taxation of Short Term Debt Funds. A short-term debt fund provides an opportunity to those investors looking for investment option for 1-3 yrs time period. This suits investors who look for a return more than a traditional fixed deposit with moderately low risk than any long-term debt funds. Short term debt funds invest in money market securities and bond securities which provide investment in shorter duration (1-3yrs) with high liquidity. One of the main goal of investors of bond funds in safety of capital. As other mutual funds, Short-term funds are also available in Growth option and dividend option. This means the interest is added back to NAV in growth option. While the interest income is paid as dividend to investors on a regular interval of time. Risk Associated with Short-term debt fund is moderately low. Due to less time till maturity, Interest rate risk is less compared to long-term bond funds. There might be a change in the price of the fund on interest rate change, but that totally depends on the change in credit risk rating of the portfolio. Selection and evaluation of short-term debt funds before the investment is an important aspect of investing. Not every fund offers same risk-reward combination to investors. It is upon the investor to decide the risk profiling of their investment to get the desired result. An investor should look out for an investment horizon of the debt fund. It is an important parameter, as it defines the investment prospects, returns, and risk associated with the fund. An investor should always try to match his/her investment period with the average maturity of the fund to get the optimum risk-adjusted return from the investment. Debt funds invest in debt securities of different credit ratings as per investment strategy. Credit ratings are assigned by external credit rating agency. They are rated on the creditworthiness of borrowers and their likelihood of default to investors. Sovereign bonds are issued by Govt. are of highest standard debt securities with no risk. Bonds with AAA, AA, A are considered safe which are issued by PSU and Corporate bodies. A fund can increase its return by lowering the credit rating of the fund. But, at the same time, it increases the volatility that may lead to losses. An investor should look for the average maturity value of the portfolio, in order to ascertain the interest rate risk. Lesser the time till maturity of the fund, least will the impact of the change in interest rate. Quantitative indicators: What parameters to look in Short Term Debt Funds? Average Maturity: It signifies the average maturity value of holding of securities in the portfolio. Modified Duration: It determines the change in the price of a security in response to a change in the interest rate of 100 basis points. The fund with a longer duration of modified duration of the fund will have a large impact of the change in a percent change of interest rate. E.g. If interest rate goes down (or up) by 1% in a month, the NAV of Bond fund is likely to go up (or down) by 5% with modified duration of the portfolio as 5 years. As the interest rate going down for fixed term deposit and for the time ahead because of soft inflationary pressure, good liquidity condition in the economy. 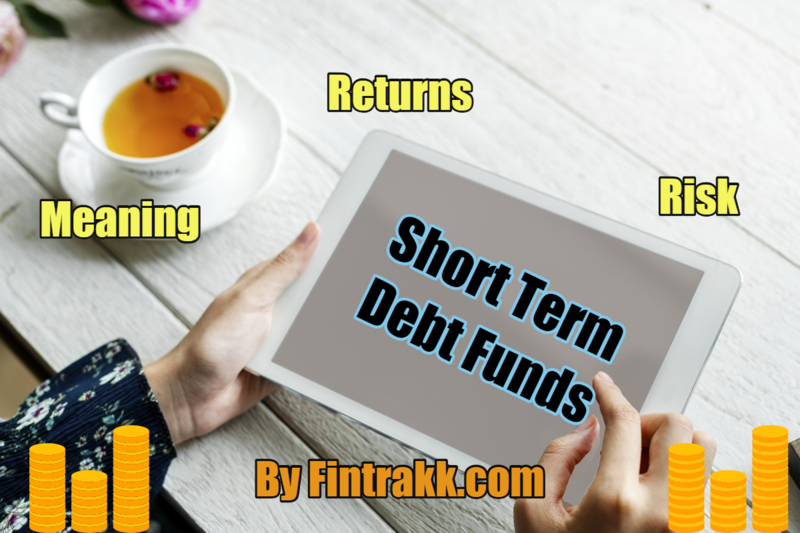 Short term debt fund can help the investors to beat the fixed deposit return by few extra percentage points with moderately less amount of risk involved and picking the best fund to get the good return. If we compare the historical return of top 5 short term debt fund with fixed deposit, We observe that the return (Table A) percentage of Short-term funds are more than Fixed deposit rate of 7-7.5% for the period of 1-5 yrs. Falling bond yield after demonetization has made bond market more attractive. Post taxation of capital gains, still the investment on short-term debt fund score over fixed deposit. A good alternative to investing the surplus cash that won’t be needed for another 2-3 years. Less impact on the fund of Interest rate risk and inflation. Fund’s return is not impacted by the volatility in market. These are highly liquid funds, means investors can have access to funds very quickly. Low Return: The return on investment in short-term debt funds are low. Low returns of the fund can be justified against low volatility and high liquidity of the fund. Taxation: The gains in the funds are taxed which affects the total return of the fund. Bond funds are taxed differently from equity funds. A bond fund, if sold within 3 yrs of the investment which is a short-term investment and is taxed at 10% (Short term capital gain tax). If more than 3 yrs ( Long term capital gain tax), it is taxed 20% with the benefit of indexation. ALSO READ How to invest in Systematic Investment Plan/SIP in Mutual Funds? The main purpose of the short-term debt funds is to provide an easy investment option to investors with a time horizon of 1-3 yrs with a moderate amount of risk. It serves the alternative to investors who need the safety of capital and looking for a way to earn yields higher than those available traditional Fixed Deposit. Hence, Short term debt funds can help the investors to beat the inflation and unfavourable market conditions in both equity and long-term bond market. So, where do you like to invest? Which one do you prefer short term debt funds or long term debt funds? What’s your take on traditional options like PPF and Fixed deposits? Feel free to share your feedback. « Automation as an Investment for SMBs: Is it Worth and How to Do It?